Special education teachers instruct students with one or more disabilities, which can include physical, learning, mental, and emotional disabilities. This type of teacher often adapts the curriculum for students so they can learn in the ways that are most effective for them. Special education teachers may teach an entire classroom of special education students with varying disabilities and age levels or may team up with a general education teacher when a class has a mixture of students. They may also provide group or one-on-one support for a few hours a day to students who require accommodations such as extra time to complete an exam or having exam questions read aloud to them. A special education teacher salary can vary depending on location, experience, and whether they're working for a public or private institution. Education: All U.S. states require a bachelor’s degree to apply for a license to teach special education in public schools. Some states require teachers to earn a degree in special education specifically, while others allow them the option of majoring in another related area and minoring in special education. 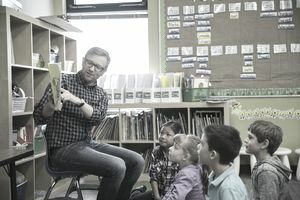 Some states also require teachers to get a master's degree in special education, but teachers are usually allowed to pursue that after beginning work in the field. Private schools may have different education requirements. Experience: Most degree programs include student teaching as a requirement to graduate. This gives undergraduates experience working in a classroom setting under an experienced teacher in the field. Licensing and certification: All public special education teachers must be licensed for the grade levels at which they teach. The license application process usually includes providing proof of a bachelor's degree, completion of a teacher preparation program, experience student teaching, passing a background check, and passing a certification test. However, private schools don't always require licensing. For those who did not study special education in college, many states offer alternative certification programs. These programs are designed for new graduates with little or no teaching coursework under their belts. Interpersonal skills: Special education teachers must coordinate frequently with teachers, counselors, therapists and social workers to develop IEPs and track progress. Working every day with the students also requires sharp interpersonal skills, patience, and compassion. Organizational skills: Teachers must keep track of students, their needs, and their progress, and complete paperwork to inform all stakeholders about how students are performing and behaving in class. This requires special education teachers to be highly organized in what can often be a disorganized and even chaotic environment. Resourcefulness: Special education teachers must be able to adapt the curriculum to meet the special needs and learning styles of students and figure out how to best present information to different students. The U.S. Bureau of Labor Statistics projects job growth of 8 percent from 2016 through 2026 for special education teachers, which is slightly higher than the 7 percent growth rate it projects for all occupations. The largest employers of special education teachers are public and private elementary and secondary schools, although some may work in hospitals, residential facilities, and private homes. Although the work of a special education teacher can be rewarding, it can also be emotionally and physically draining. Special education teachers typically work during school hours, and they may prepare lessons and meet with parents, students, and other teachers outside of school hours as well. Some schools offer a traditional 10-month school year with a two-month summer break and shorter winter break, while others offer a year-round schedule with nine weeks on and three weeks off. The National Associate of Special Education Teachers (NASET) lets member search special education jobs throughout the U.S. and get career guidance and tips. Registered users can search K-12 can do detailed searches for teaching jobs with specific keyword like "special education." The Council for American Private Education website is a great resource for candidates hoping to work in private schools.